I went to a new film last night called "People of a Feather" by Joel Heath. It is a documentary about the Inuit people of Belcher Islands, and about the Eider ducks that make a year round home there. I was not very keen to go because I read in the review that Hydro Quebec was being blamed for the disappearance of the Eider ducks. The review I read was kind of confusing, both accusing Hydro Quebec of causing more ice, and accusing it of melting the ice in Hudson's Bay. I was not looking forward to seeing an emotional movie of dying ducks juxtaposed with massive dams, even if there was a logical scientific connection being made between the two. But Mary Ann convinced me to go anyway despite the chance of it being more about Quebec bashing than about science. My own history is very close to this subject. I grew up in Baie Comeau, during the time that Hydro Quebec's first massive dam was being constructed, and Baie Comeau is at the mouth of two rivers that were dammed by Hydro Quebec, and on salt water too. Before the movie, I tried to look up some scientific studies connecting the Eider ducks with Hydro Quebec, but didn't find any. I did find a study on the decline of the Eider duck, and a different study on the effect of the dams on salinity, ice, and currents in Hudson's Bay. Both these studies were filled with numbers, measurements, and devoid of emotional hysteria. The second study concluded that the dams might add about .2 % more ice to Hudson's Bay in the winter, which resulted from equalizing the seasonal flow of water. Apparently the undammed rivers flowed more water in the summer and less in the winter. With the dams, the seasonal flow is about equal. I realized at the end of the movie, that at no time had Joel Heath made any explicit statement about blaming Hydro Quebec. But he quoted Unuit as saying that it was when the hydro Quebec dams were built that the Eider ducks started to disappear, and the ocean currents weakened. And along with that narrative, we see pictures of dying Eider ducks. It was not made clear to me why the Eider ducks in the movie were dying. But I think to many other people in the theatre, it was obvious: the dams were flooding Hudson's Bay with warm fresh water, that caused the ducks to die. Most Canadians should know how big Hudson's Bay is, it's that big round thing that takes a bite out of the top of the country. James Bay is the smaller Bay at the bottom of Hudson's Bay. James Bay is 200 km across, and that's where the massive Legrand River empties, and has poured fresh water for hundreds of thousands of years, I assume. About 200 km from the mouth of the river are the Belcher Islands. Any effect of the LeGrand Dam felt on the Belcher Islands there would be very subtle and hard to measure. I'm not saying that it does not exist, and there are new dams being built, but I think the film gives the impression that the islands are much closer to the mouth of the river. I did notice that despite the Belcher Islands being only about 50 km from Quebec, thay actually are part of Nunavut territory. Nunavut apparently owns almost all the islands in both Hudsons Bay and James Bay, a fact that I was not aware of. 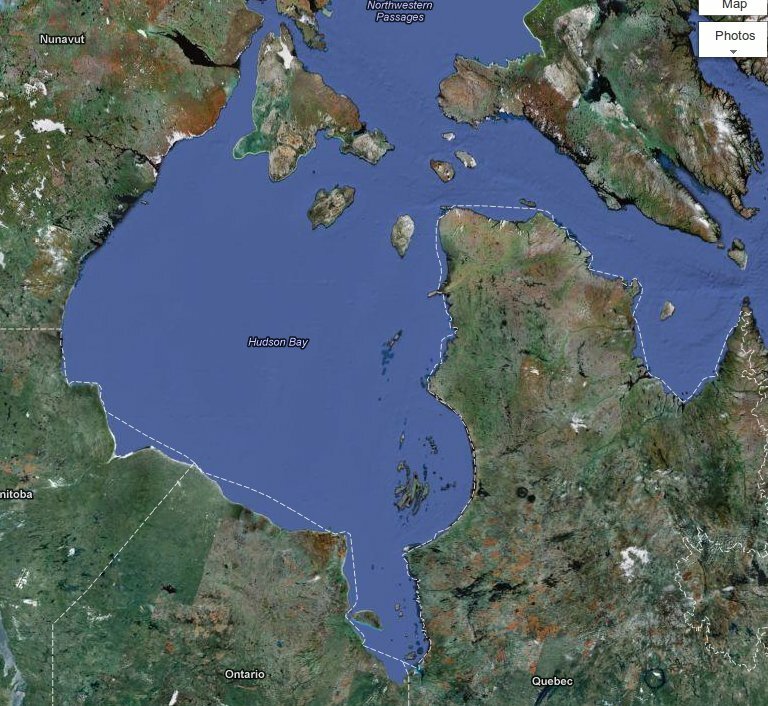 In the picture, you can see how close Nunavut's border is to the Quebec and Ontario shoreline, but especially Quebec. And if you use Google Maps and zoom in, it is even closer than would appear in the large scale map, cutting off what appears to be thousands of little islands right next to the shoreline of Quebec. Then the border of Nunavut disappears at Labrador, on Google maps anyway so I have to look that up later. That area has to belong to somebody. Now back to the film. The most extreme statement in the film was from David Suzuki, but it was taken off an old TV show he made, probably long before the Eider duck problem surfaced. David was quoted as saying that 300 times the amount of water was being released due to these dams. I have no idea what the context of this snippet was, but the fact is that the dams, averaged over a season, do not release 300 times as much water. Hydro dams do not create water, they regulate the flow. The biggest disruption the dams could ever make would be during the years that it takes to fill the reservoir, when the river flow is stopped. It is not in the later ongoing release of water to produce electricity. But because the David Suzuki documentary was not officially part of this movie, the number 300 was never explained. The film maker, Joel Heath, did make his own statement about the ducks and the ice. I can't remember it exactly, so to paraphrase: "It is not about more ice or less ice killing the ducks. We don't really know what is killing them. It could be the unpredictability of the ice." Or something like that. And that's the closest he came to blaming Hydro Quebec explicitly. But this statement is played over images of ice shifting, crashing, moving about at high speed, and of course dead ducks. I'm not at all sure that people at the Princess cinema who do not live on icy salt water shores would even know that the images were speeded up. Maybe they did know. But do they also know that ice shifts around all the time, with wind, tide, waves, and currents? Any animals or birds living in this harsh type of environment have to deal with ice all the time. And as far as I know, birds do not "predict" ice patterns. They look for holes and use them until they disappear, then look for others. If they don't find any holes in the ice, they may die. It's sad but true, that nature is cruel. Ducks die all the time, with or without dams. When I see a picture of a dead duck covered with crude oil, I am pretty sure I see a connection with the oil spill. But when I see a picture of a duck dead under or on the ice, I'm really not that sure it was caused by Hydro Quebec releasing fresh water from a river 200 km away, especially since that river has been releasing fresh water for thousands of years before that. It would have been useful to talk a bit more in the movie about global warming, which is an effect that is strongly felt in the arctic, far away from the Hydro Quebec dams, from Alaska to Labrador, but very little was said about it. The lasting impression of the film is that global warming is not a big problem any more, now the real threat is the Hydro Quebec dams. And actually, the Hydro Quebec dams minimize global warming, by producing renewable power without releasing CO2 into the air. Why not talk about that?